Japanese spindle (Euonymus japonicus): growing, planting, caring. One of the most popular species of spindle ! Euonymus japonicus is a popular ornamental plant both for parks and gardens. Numerous cultivars have been selected - often with variegated or yellow leaves - are widely grown in all soil types in sun or shade. It can be used for hedges in mild climates. Some of the more distinctive cultivars are 'Albomarginatus' - with green, narrowly margined white leaves - 'Bravo' - with green and creamy-yellow variegated leaves and a upright habit - 'Green Spire' - an evergreen columnar narrow shrub - or 'Kathy' - with green and white variegated, broad leaves, and a shorter habit than most. Euonymus japonicus - the Japanese spindle or evergreen spindle - is a species native to Japan, Korea and China. 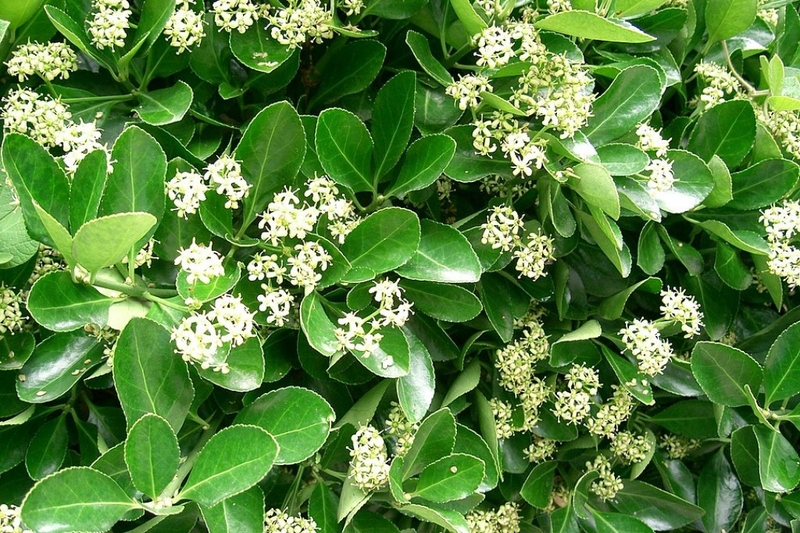 It is an evergreen shrub or small tree growing to 2–8 m (6 ft 7 in–26 ft 3 in) tall, with opposite, oval leaves 3–7 cm long with finely serrated margins. The flowers are inconspicuous, greenish-white, 5 mm diameter and in autumn, orange fruit hangs below the flaring pink seed coverings. Plant your Japanese spindle in a sunny spot, sheltered from cold winds if possible. A site with moist, fertile soil is preferred, but most of all it should drain well. The Euonymus is not very demanding, and after the first season, it will tolerate some omissions of watering in open soil. Still, water copiously the first year after planting or after repotting, and of course once or twice a month for Euonymus in container or pot - depending on the quality of mulching. Cut the dead flowers and dead wood after the flowering. Mulch your spindle before winter to avoid weed growth and bring the soil the organic matter it needs. You will repeat the mulching in May if necessary. Repot your potted spindles every 2-3 years, or top them with some compost or potting soil. In August, cut 10 cm long twigs and plant in a sandy mix, that you will keep in a warm place. When the roots appear, transplant the cuttings into individual pots in garden soil : you will put them in place the following spring.